Feel confident taking it everywhere... it doesn´t look like a mattress. Included in Parents magazine Best Buys list as a must-have baby gear item. 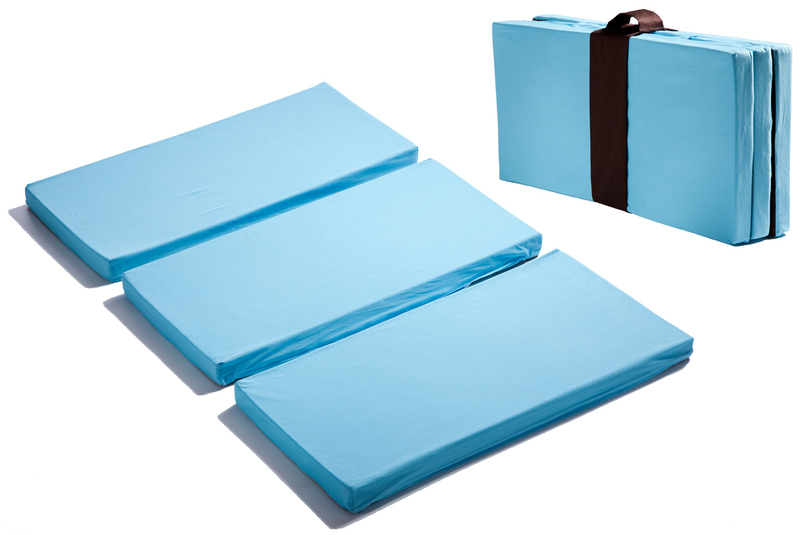 Perfect for home, daycare, hotels, grandparents’ and babysitter´s house, park, and camping. Inside play yard - on top of the play yard mattress. In bottom or in bassinet. Outside play yard - a tummy time mat, a changing pad, a portable play mat, a pad under baby jumper, a nap mat on floor, or even a toddler bench when folded. Fold it up and pack it with blankets in the Travel Bag. Includes a separate carrying handle. Matches the firmness of a parent´s chest: baby´s favorite place to sleep. Prevents flat head syndrome by keeping baby off the play yard’s hard floor. Washes by simply unzipping the cover. Safe for baby and home. Free of toxic chemicals and flame retardants and exceeds all US safety standards. High resilience foam: it will not suffer indentations or lose its shape. Patented (US D685,211). Blue, Pink, Silver, and Oreos. Contrast of colors of Oreos stimulates baby’s vision. 97% cotton twill and 3% spandex for extra comfort. Soft quiet fabric with an elegant satin-like finish. In gender neutral Aqua. Breathable: baby stays cool and comfy! This unique fabric prevents liquid, dirt, and oil from seeping into the Mattress Topper. Cover also removable and washable. Silky soft polyester fabric, not vinyl, so it´s safe and quiet - never crackly. Safe for baby: lower layer of PU (polyurethane), recommended by the Washington Toxins Coalition and used to make reusable diapers. It conforms to all regulations by the Consumer Products Safety Commission. Free of flame retardants, lead, bpa, and phthalate and meets CertiPUR-US rigorous standards for emissions, content, performance, durability, and environmental stewardship. Designed to fit tightly in all standard size play yards. If questions arise in assuring proper fit, please, click HERE to contact us, and we will check for you. Use a top quality fitted play yard sheet and tuck it around both the hard-board mattress and your Smart Mattress Topper. Don’t place the product where your child may fall. Place it only on the floor or inside a play yard. Fits perfectly in all standard play yards: Graco, Chicco, Nuna Sena, Boppy, Eddie Bauer, Evenflo, Baby Trend, Safety 1st, Arms Reach Original, Aprica, Cosco, Combi, Boppy, Nature's Purest Comfort, Bright Starts and more. However, it does not fit the non-standard sized play yards like 4Moms Breeze, Maxi Cosi, Phil & Teds Travel Cot, the Nuna mini, Graco Travel Lite, Guava GoCrib, I´coo Panama, Totally Scrumptious by Heidi Klum, Safety 1st Prelude Sport, KidCO Travelpod Portable Bed, or Parentlab JourneyBee Portable Crib. If your brand is not listed, please click here to contact us, and we will check for you. With NAMI there's hope! Many families get help with mental health issues, like with post-partum depression or post-partum psychosis, with NAMI: a wonderful organization that offers program for free all over the country. By buying MamaDoo Kids products you are helping NAMI, the National Alliance on Mental Illness, the largest organization that educates, supports, and advocates for families dealing with a mental illness like depression, an anxiety disorder, bipolar disorder, schizophrenia, ADHD, OCD, etc. NAMI offers many programs: all for free. One of them is NAMI Basics: a program for parents of children and adolescents with emotional and behavioral difficulties or a mental illness. When we first became parents we were overwhelmed by all the baby products on the market: What do we really need? What is the best brand? One such item was our Play Yard/Pack n Play… a great invention, easy and fast to set up and transport. There was only one problem: that floor-board-mattress was just too hard and uncomfortable for our son -and ourselves!- to get any rest. That’s when I decided to design something myself that was comfortable but also pretty and multipurpose. The Smart Mattress Topper was born! We decided to share it with other parents so they could help their children (and themselves☺) in getting some rest too. We measured every play yard on the market, determined the best size, experimented with and mastered the perfect design, looked for the best high quality non-toxic components, hired a manufacturer in California, and off we went. So many parents have written to thank us, because whether they are at home or on vacation, their baby is finally comfortable and everyone is more rested. We are very proud of our MamaDoo Kids Smart Mattress Topper and believe that you and your child will be very happy with yours!